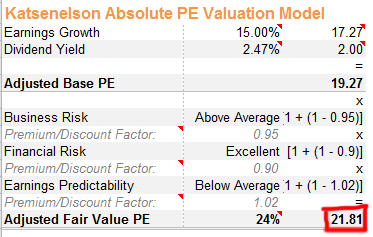 What Is Vitaliy Katsenelson’s Absolute PE Model About? Finally. Putting the Absolute PE Model Together. Back in 2011, I got around to reading and applying Vitaliy Katsenelson’s book Active Value Investing which I also list in my best investment books for value investors. In it, he lays out a simply framework as well as a valuation method which he calls the absolute PE model. I use this model in my stock analyzer as an alternative to simply relying on relative valuations. If you haven’t read the book, check out my review of Active Value Investing because it’s a very informative and resourceful book. Plus, if you want to see how a pro goes about thinking about the markets and valuing stocks, it certainly is worth the read. From this point onward, you’ll want to slow down your reading, bookmark the page or download a pdf copy below. There is a lot of information to process to understand how this stock valuation method works and how it all comes together. At 2,500 words, there is a lot of reading here. Keep in mind that all the information is directly from the book. I’m just adding my interpretation and application here. This model derives the intrinsic value of a stock based on the following five conditions. Like all valuation models, there is subjectivity involved. In this case, you are required to grasp an understanding of the business and then quantity the level of risk involved. You have to decide whether the business risk is low or high and assign a premium value to it or give it a discount. It’s confusing at the moment, right? But you’ll get it by the end of this article. Since this model is based on the workings of the 5 conditions mentioned above, it’s important to understand the big picture for each condition. Instead of just trying to get the formula and start working on it, take a step back, look at the big picture and you’ll find it really easy to use this absolute valuation model. 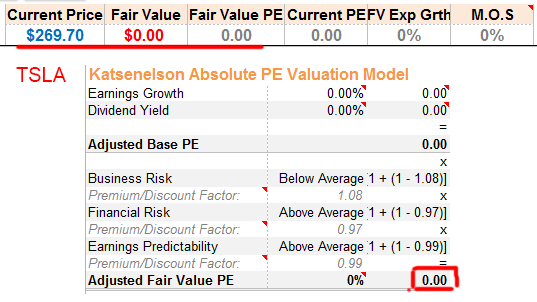 Part of the reason why I created the no growth PE screen backtest was because of this valuation method. I needed to know whether my conservative nature of using a PE of 7 for no growth was factually correct. My results show that a PE range of 7 to 8.5 is perfectly acceptable so you are free to use whatever suits you. A recent article I wrote on the Graham number explains all this in detail. Now the original Graham’s Formula, not to be confused with the Graham Number, used 8.5 as the no growth PE and Katsenelson uses a PE of 8 in the book. I on the other hand will stick with my PE of 7. 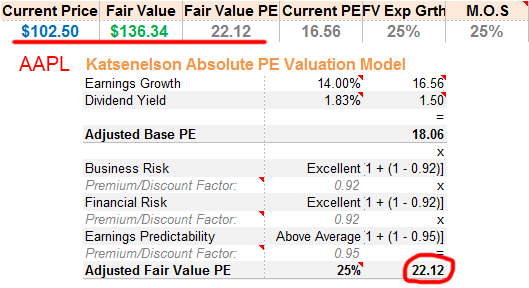 If you flip the PE over, you get an earnings yield of 14.2% compared to 11.8% and 12.5% for Graham and Katsenelson respectively. With the small caps I analyze and the fact that the Graham’s formula produces optimistic valuation numbers, demanding an earnings yield of 14.2% is better than 11.8%. In a bullish market, demanding a 14.2% return is unrealistic, but that doesn’t mean I have to compromise. It’s simply a criteria that I’m happy with and something that works for me. Now, if you mainly focus on analyzing large caps such as MSFT, XOM, or GE, it’s ok to keep the PE to 8.5. Stock valuation is subjective and all depends on your interpretation. If you have a good thesis on why you are using a certain number, that is 100% ok.
Logically, higher growth rates leads to a higher PE. I recall vaguely in a Peter Lynch book mentioning that he considers the PE of the stock to be its expected growth rate. If you know which book this idea is from, let me know. To Lynch, a PE of 12 means the expected growth EPS growth rate is 12%. PE of 20 is 20% growth rate. However, this model doesn’t use a linear relationship. The absolute PE model is set up so that for every percentage of earnings growth from 0% to 16%, the PE increases by 0.65 points instead of 1 point. If the growth rate reaches a certain level, in this case 17%, the PE value is increased by 0.5 points. The reason for this is because you’ve witnessed many times that the higher the growth rate, the greater the fall from the top. Refer to the table below to better understand the relationship between the stock’s PE and the expected EPS growth rate in the Absolute PE model. The “Original P/E” column is what Katsenelson uses in the book. The “P/E” column is my adjusted number. For a stock like MSFT, the current PE is 17.26. Using the table above, the expected earnings growth is 15% because I round down. Now, depending on the type of company, a premium or a discount is applied in the actual valuation stage. What this means is that a stock may get extra points for having a better earnings stability and predictability. Think of it this way, the earnings visibility of Coca Cola (NYSE:KO) or even Microsoft (NASDAQ:MSFT) is clearer than Salesforce (NYSE:CRM) or a cyclical company such as Caterpillar (NYSE:CAT). Dividends are tangible to the investor whereas earnings is not. Dividends provide you with a hard return whereas you may never get to see earnings. For this reason, a stock that gives dividends gets extra brownie points. In the valuation model, every percentage of a dividend yield equals one extra point. This contrasts the non linear relationship between earnings growth and PE as shown in the table above. The right side of the table shows how the points work for dividend paying stocks. If the dividend yield is below 1%, the bonus point is 0.5. Looking at MSFT again, the dividend yield of 2.47% means it gets 2 points. Not 2.5 points because it is lower than the required 2.5% threshold. When it comes to trying to determine the risk of a business, everyone has a different opinion. This is where experience and knowledge of the industry plays a big role. What you see as a risk may be overlooked by other and vice versa. I may penalize MSFT for its business model whereas you may give it a premium. Same company but two different valuation results. But you need to assign a single number to represent risk to utilize this model. It’s the weakness of the model, but when you try to keep things simple, there is always a tradeoff. For business risk, you want to consider the industry the company is in, the products, the life cycle, concentration of products and customers, environmental risks and anything else related to the operations of the business. The level of financial risk can be determined by examining the capital structure of the business as well as the strength of the cash flow in relation to debt and interest payments. Earnings visibility is analyzed in much the same way. Below are the risk points to use in the model. For an average company, you will want to assign a value of 1. For a market leader, select a number less than 1. If you believe a market leader deserves a 10% premium, then use a value of 0.9. If a 15% premium is deserved, then 0.85 is the number to use. For a market lagger, select a number greater than 1. Poor companies should be discounted. A 20% discount means a value of 1.2 will be used. Use 1.1 to penalize a stock by 10%. Before moving onto examples of how this model is used, a couple of points made in the book should be discussed. Based on the business risk, financial risk and earnings visibility, additional PE points are added to the basic PE. For example if a company is expected to have 10% earnings growth with 0% dividend yield, according to the table above, I would assign it a PE of 13.5. Now, depending on how good the company is, additional PE points are added based on business risk, financial risk and earnings visibility. Katsenelson writes that he limits the premium to the basic PE to be no more than 30%. In other words, if the basic PE is 13.5, despite how good the company is, the final adjusted PE won’t be more than 17.55 (13.5 x 1.3=17.55). If the basic PE is 10, then the ceiling will be limited to PE 13 (10 x 1.3 = 13). The model assumes that inflation and interest rates are average and not expected to increase or decrease to dramatic new levels. In the current environment, interest rates are low with possibility of inflation. If inflation and interest rates are expected to rise, then the zero growth PE should be adjusted down and vice versa. There is a caution against using current interest rates without considering the long term direction. Enjoy what you’re reading? Get instant access to our articles via email and receive bonus investing spreadsheets. Now let’s put everything together. To get the Basic PE, you start with the current PE and any any extra dividend points. For MSFT, the starting PE is 17.26 and the dividend yield of 2.47% gives it an extra 2 points. The starting Basic PE is 19.26. For business risk, financial risk and earnings visibility, it’s easy to start guessing so I created a systemized and automatic method to do the scoring. It’s available to all premium OSV members but here’s the screenshot of each section to help you come up with your own methods. This one is to determine business risk where I look at the trends of ROE, ROA, CROIC and intangibles as a percentage of book value. MSFT gets a 15/20 which is considered above average. The stock gets a premium factor of 5% in the fair value calculation. To quantify financial risk, I look at the current ratio, total debt to equity ratio, short term debt to equity ratio and FCF to total debt. You can check some other balance sheet ratios and come up with your own. Here MSFT scores a perfect 20/20. My max premium score is a bonus of 10%. This is where you’ll disagree with me, but earnings predictability for MSFT is below average. A company has be be consistent in this condition to receive high marks but MSFT has lost points in a lot of areas here. A score of 9/20 means earnings predictability is below average which receives a penalty of 2%. When you apply all this into the formula above the fair value PE becomes 21.81. The intrinsic value for a PE of 21.81 is $57.33. There’s no such thing as an absolute intrinsic value of $57.33 so the next step to further improve the valuation is to work on the upper and lower assumptions. This is something I’ll leave for homework. See if you can come up with a lower and upper range and leave a comment below. Some quick thoughts on AAPL. AAPL has achieved ROIC and CROIC in the 30% range consistently with debt that is easily manageable. With the stock at $100, it’s equivalent to $700 presplit. But with the growing again expectations of the new iPhone, iWatch and future products, it looks like AAPL could be worth around $130. Another very strong brand with a deep moat. An easy stock to buy and hold for the long haul. Not surprising that Buffett loves the way this company is operating and the strength of its business. But what does Katsenelson’s Absolute Model say? It doesn’t get top marks for everything, but Katsenelson’s model agrees that IBM is an ivy league company. With negative returns in all important areas as well as huge cash burn, TSLA doesn’t score well for business risk. A clear indication that it’s all about the growth for TSLA as opposed to stability of the business. Surprisingly, TSLA does score well for financial and earnings predictability. TSLA is also a case where you can see the weakness of this model. Since the stock as negative earnings which results in no PE, the model starts with a basic PE of zero. And when you try to multiply anything by zero, you get zero. Every company is unique and you can’t and shouldn’t use a DCF for every stock. It’s easy to start plugging in numbers into a spreadsheet and believing what the numbers tell you. But what you should really have a bunch of valuation models that you can go to and pick the one that is applicable for that stock. 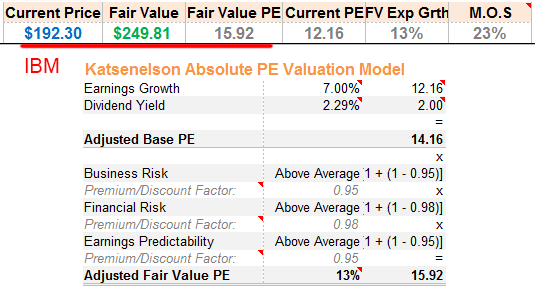 The Absolute PE model shows that it works well for stocks like MSFT and IBM, but fails with TSLA. I’m sure there is a way to value TSLA, but I’m the wrong person to do it in this case. What the Absolute PE method will help you with is to apply a method that uses stock multiples in a much more isolated manner. Instead of just focusing on the competitor multiples and trying to fit your stock to their standards, you can take a step back and use it in an absolute sense. 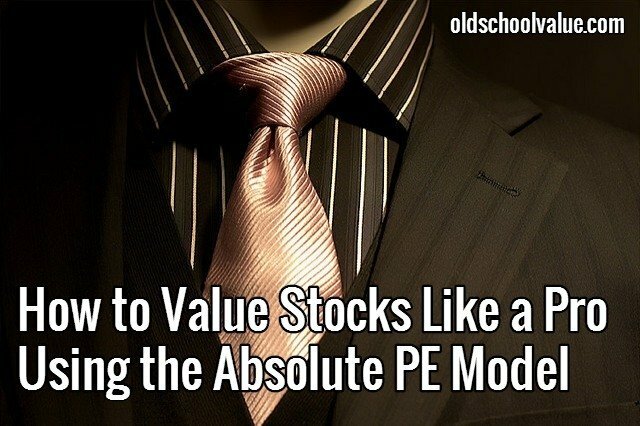 I regularly use the Absolute PE Method for my own stock valuations and if you don’t want to deal with the hassles of manually calculating the same thing across companies every time, then try out old school value. The model does have subjectivity and the results will end up being only as good as the inputs, but it’s a technique that is easy to learn and apply. Jae Jun is the founder of Old School Value. He is on a mission to provide practical and actionable value investing tools, tutorials and educational material to help empower the individual investor. Keep in touch with Jae via any of the methods linked below.